It’s estimated that 14% of the average American household’s water use is actually due to household leaks. Nationally this translates into more than 1 trillion gallons of water leaking from U.S. homes each year, or the equivalent to the annual water use of Los Angeles, Chicago, and Miami combined! The source of these water leaks? Typical culprits are running toilets, dripping faucets, and other leaking valves. All are easily correctable. Use your water bill to track your household’s water use. Knowing how much water your household typically uses will make it easier for you to tell if you are using more water. If your water use seems high, first determine if the increase is due to changes in your daily routine. If not, you may have a leak. Contact your water provider to find out about your household’s annual water usage. Take 10 minutes to check your toilet for leaks. It could save you hundreds to thousands of gallons of water a month. Regularly check your faucets, showerheads and outdoor spigots for leaks. 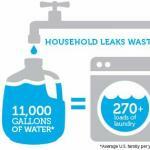 According to WaterSense, 10 percent of homes have leaks that waste 90 gallons or more per day. Common types of leaks found in the home include leaky faucets, showerheads, and outdoor spigots. All are easily correctable and in most cases replacement parts are fairly inexpensive. Use your water meter to check for leaks. To do so, check your water meter before and after a two-hour period when no water is being used. If the meter does not read exactly the same, you probably have a leak. See how to use your water meter to check for leaks. Leaky sink faucets are often caused by faulty washers that don’t allow your faucet to shut off properly. Replacing faulty washers is an easy and inexpensive (less than $1) way to recoup water and money savings. Toilet leaks are often easy to detect and repair. Annually testing your toilets for leaks by using dye tablets or food coloring is key to quickly repairing leaky toilets. Many toilet leaks can be fixed by a do-it-yourself plumber, and are relatively inexpensive to implement ($5-20).